Okay, I said recently that I planned to stay more on "what it's like to head to a seminary after leaving ministry" focus, but I'm slacking. Today was my third and last day of un-encumbered "moving-in" activities. This has been tougher than I thought. I like the grad apartment I'm assigned (and subsidized prices are essential and wonderful). But the space I have is still significantly less than what I had before. For instance, both of my large bookshelves won't fit in my room - so sorting through "which books stay in here and which go to the living room" is an arduous process. Also been living on craigslist to find a lofted bed or bunk/futon combo. This evening I completed a required course from North Park on their Blackboard system "eLearning: Prepare for Success." They said it would take 5-6 hours to complete, and that if it was not finished satisfactorily, my registration would be dropped. Thank goodness it took only three hours. 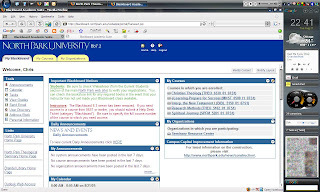 The course was a tutorial on the use a web browser, file attachments, and discussion boards. bummer. Is it out-of-step for me to feel like this is remedial stuff in 2007? Nice as a resource... but mandatory for incoming students? I sorta wish my time had been respected a bit more to let me try to finish moving in. :-7 Or try for the 2nd time to get a University parking sticker (first visit - the office guy said he wasn't sure how to do it, and asked me kindly to return). "Live" in-person orientation (10 hours of it) starts tomorrow morning at 8:30am. And while I'm not looking forward to endless talking heads there, it doesn't mean I'm not happy to be here: I was reading my syllabus this evening on my New Testament class with Klyne Snodgrass, and just the required reading list made me excited.